< a> I went to a lecture by Galen Burrell of Arup, on climate-based daylighting design. One graphic that I particularly liked was the above, showing total energy usage vs. daylight penetration. As you add more windows, you need less electric lighting, but you also have more thermal gain resulting in higher HVAC loads. 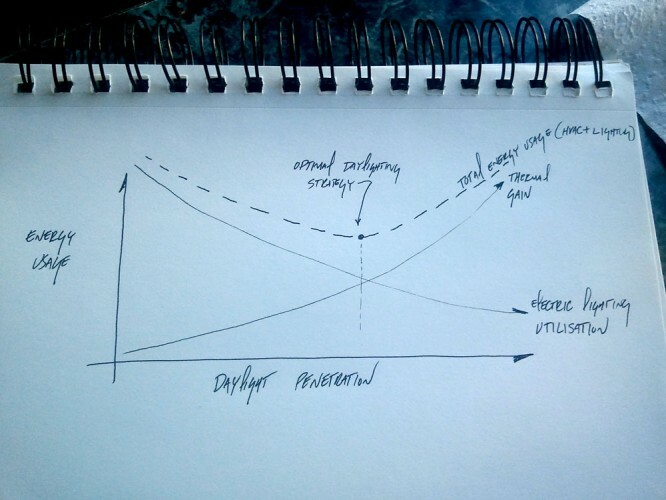 So daylighting design boils down to an optimization problem, finding the saddle point between those two curves. Neat!